Moléson-Village was born of the fertile imagination of several Fribourg residents who had a vision for developing the economy and tourism at the same time. The utopian idea of the 1960s to build a model village was eventually killed by controversy and financial difficulties. It began to take shape again in 1978, but in a much different form than originally imagined. This epic story is just as much about tourism (the dream of a mountain resort) as it is about architecture (more than 150 plans, most of which never saw the light of day), economics (more than 20 million francs invested) and even sociology. The goal of this article is to summarize the facts related to the various stages of this adventure without distorting the issues involved. Robert Boschung, the property developer of the « Vieux Chalet » in Crésuz, had dreams of a restaurant on the summit of Moléson which would be linked to Epagny by cable car. He gathered together several influential Fribourg personalities who were enthusiastic about the idea of developing tourism in the canton. In November 1959, the committee took the initiative of presenting an request to the federal department of post offices and railways for permission to build a gondola from Pringy to Plan-Francey with a mid station at La Chaux and a cable car from Plan-Francey to the summit of Moléson. In May 1961, the Grand Conseil of the canton of Fribourg accepted a motion by deputy Pierre Morard and 60 cosignatories requesting the construction of a road between Pringy and La Chaux. Four kilometres in length and six metres wide with a maximum grade of 10 %, the road would cost approximately seven million francs, of which three million would be paid by the future resort. Construction began in March 1962 and ended in July 1963. A concession already granted to the commune of Enney forced the developers to go ahead with the construction of a standing gondola, the famous « Moléson buckets », that connected La Chaux and La Vudalla. Two ski lifts were also installed to round out the total investment to 2.5 million francs. The three terminals and mid station, designed by Lausanne architect Marc Wuarin, had concrete foundations, wooden walls and multilayer roofs. The lifts began operation in December 1963, except for the Plan-Francey – Moléson section which was inaugurated the following winter. 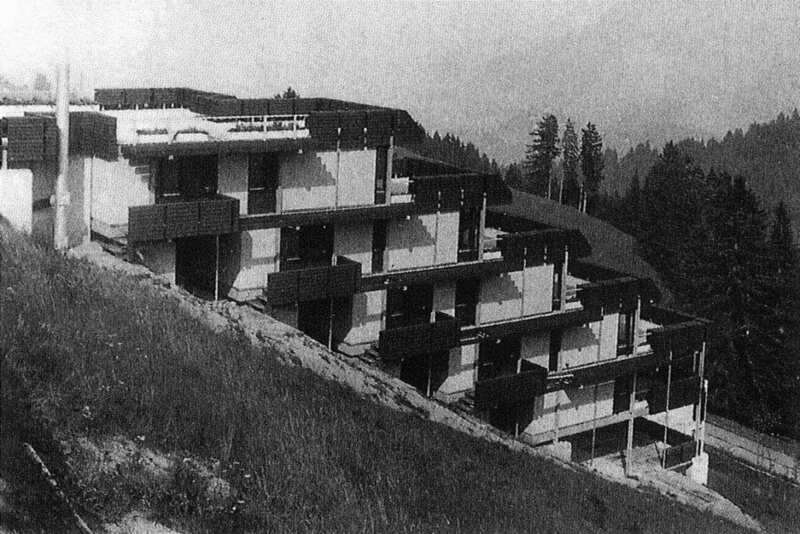 William Dunkel, distinguished Zurich architect, retired professor and member of the German Bauhaus school of design, was retained to conceive the development plan of the future resort village on the slopes of Moléson. In a presentation of the development plan to the board of directors in January 1963 he wrote: « An undeveloped region allows us to prepare a comprehensive development plan in harmony with the existing landscape. (…) It would be a shame for this project to sacrifice its well-balanced unity to egotistical fantasy and speculation owing to insufficient regulation. The author of this development plan has a preference for organized groups of buildings separated by green spaces instead of a falsely romantic village concept based on heedless modernity ». In order to combat speculation, keep from dispersing construction and avoid imitation, Dunkel decided to recommend a development plan with strict rules. The board of directors endorsed his vision. The commune retained ownership of the land while allowing the GMV company to proceed with the construction of several buildings. Potential investors had to negotiate with a sole representative offering surface rights. The system proved difficult to implement and worried more than one potential buyer. Dunkel preferred a concentrated building style « along the lines of the close-knit villages of the Valais region with landscaping between zones ». In order to avoid scattering the buildings, he proposed building the 3,000-bed village in La Chaux and reserved Crêt de la Ville and Plan-Francey for sanatoriums and luxury establishments. More lenient rules would apply to private constructions in Commun, an area not visible from the valley below. In the absence of a specific Fribourg chalet style, Dunkel advocated « an architectural form creating a natural extension of the site instead of conflicting with it ». Local construction materials were chosen – stone for the foundations and pillars, wood for the habitable parts – rectangular forms were rejected and sloping terraces divided up the volumes. The flat roof was his trademark. This development plan was cohesive and well-received. A model was even displayed at the Swiss Heritage Society stand at the 1964 Swiss national exposition in Lausanne. 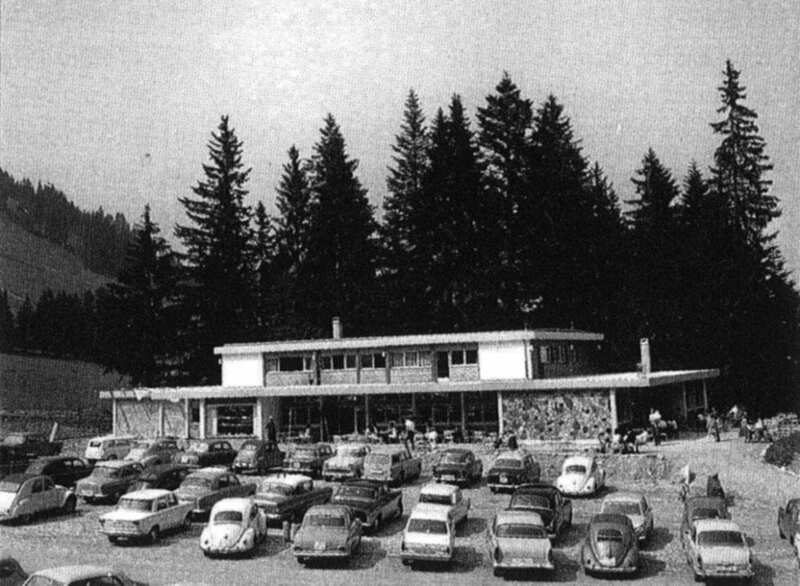 In a September 1964 report on a publicity campaign, the manager of the resort informed the commune of Gruyères that the resort had « received 260 written enquiries ». The planning process was accelerated : neighbourhoods were designed, an architectural competition was announced, plans for water supply, sewage treatment, access and parking were made. But in the end none of these plans materialized. 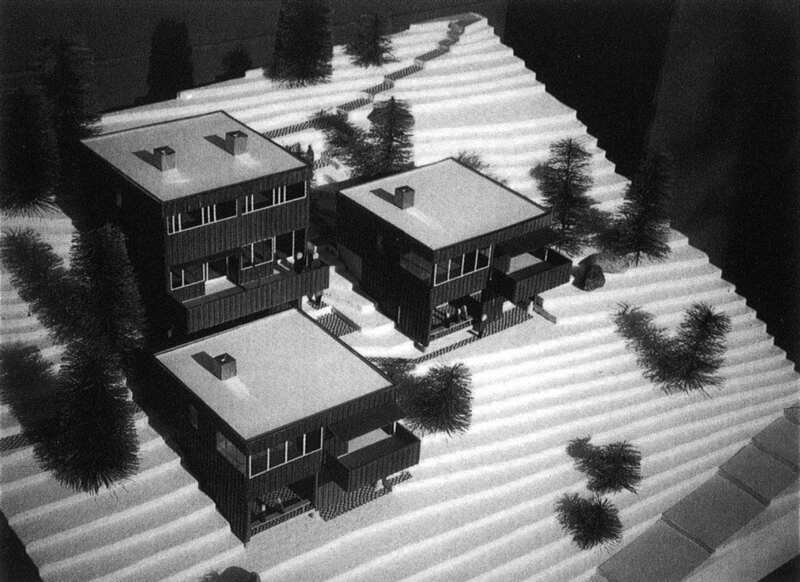 In 1966, the board of directors retained the four competition-winning architects who eventually adopted only the concentrated style, individual houses and flat roofs of the Dunkel plan. Local building materials were replaced by fibre cement, steel and concrete. 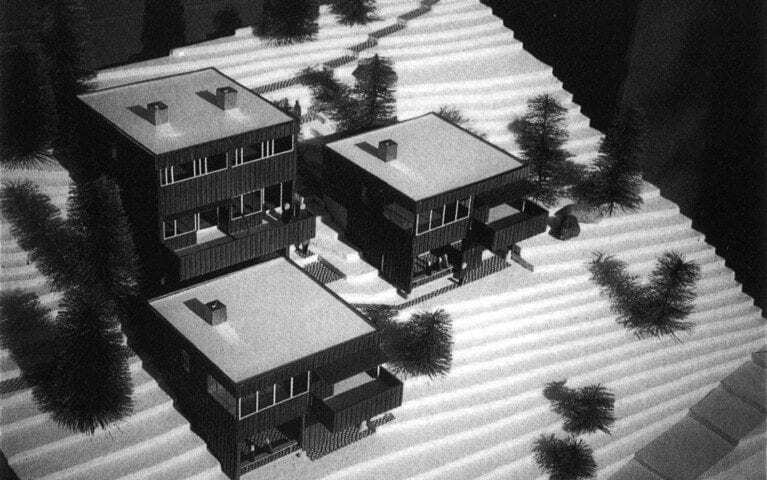 In June of 1966, the consortium presented a group of 80 houses « accessible by oblique sloping elevators and heated snow-free horizontal roads » ! But construction never began and the resort had trouble paying off both interest and debt. In January 1967, the board of directors decided to undertake construction of the first buildings on its own. One residence (Grevîre) with 18 apartments was planned, along with several holiday homes designed by architects Tüscher and Hostettler – thirty units in all from studios to five-room apartments. William Dunkel cried foul, the Swiss Heritage Society abandoned ship and the Zurich architect was ousted in October 1967. Walter Tüscher took over as the official architect for Moléson-Village. On April 8, 1971 he declared to La Gruyère newspaper that his predecessor was « responsible for an overly rigid development plan and a lack of integration with the touristic milieu ». He also made a promise to emphasize multi-family dwellings. The development of Moléson-Village was a controversial issue ever since the project was first presented in January of 1963. The press and its readers were divided, as were the Swiss Heritage Society and the Friends of Gruyères and the daily newspapers from Fribourg and other parts of Switzerland. The Fribourg newspapers – La Gruyère et La Liberté – initially displayed some enthusiasm for what an article on January 26, 1963 in the three times weekly Bulle newspaper called « an inevitable success ». But they gradually distanced themselves from what became known in the region as : « the molécubes ». The controversy centred around the use of cubic forms, cement and flat roofs. The Swiss press showered praise on the project. « Moléson-Village : An Experiment for Europe » headlined the Neue Zürcher Zeitung on February 21, 1963. The same day, the Tages Anzeiger praised the project as a potential national tourist attraction. On March 5, 1963 L’Express stated that the canton of Fribourg had suddenly « shaken off its dusty old traditions in favour of more dynamic vocations than traditional farming and confident devoutness ». The Swiss Heritage Society was in favour of the future village and displayed a model at its stand at the Swiss national exposition in 1964. Its architect, Max Kopp from Zurich, expressed his point of view in a June 1963 press release : « I believe that the question of flat or sloping roofs is secondary. There are no existing buildings on site which would impose their style of architecture ». The Friends of Gruyères replied in a letter to the board of directors dated February 3, 1963 : « Gruyère is not the private kingdom of the Swiss Heritage Society or a cable car company. (…) If the president of the GMV company wants to establish a trial zone for new architectural forms it should look elsewhere. The Commun area would be better suited for its cubes built on piles. At least the damage would only be visible from the surrounding mountain ridges. » After the architectural competition, the Swiss Heritage Society gradually distanced itself from the proposal and finally rejected the idea of the resort after the firing of William Dunkel. Difficulties selling or renting the apartments built in Moléson-Village between 1967 and 1969 led to an ever-increasing threat of bankruptcy and the company began a desperate search for investors. Some examples included: a Swedish group that expressed interest in the construction of a hotel ; a group from Lausanne which proposed a building with apartments and shops in the future village centre and an Italian group which wanted to build a hotel. The company archives revealed several proposals for saving the resort from bankruptcy. The plans were detailed, construction permits were requested and in one case a tender was even accepted. 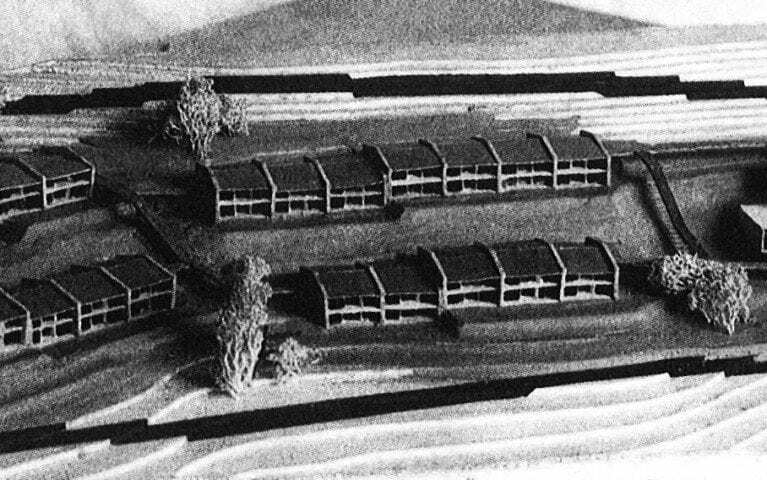 Florilège : a French group wanted to erect three six storey buildings with 500 units and a capacity of 3,000 beds (1969-71) ; the Swiss railway workers association proposed three buildings with studio apartments (1970-75) ; the Commune of Lancy was interested in building a vacation camp combined with a 500 bed military hospital ; architectural drawings for a hotel-club with 100 beds were also found in the company archives. In 1975 the company once again changed direction, abandoning real estate to concentrate on lift construction. 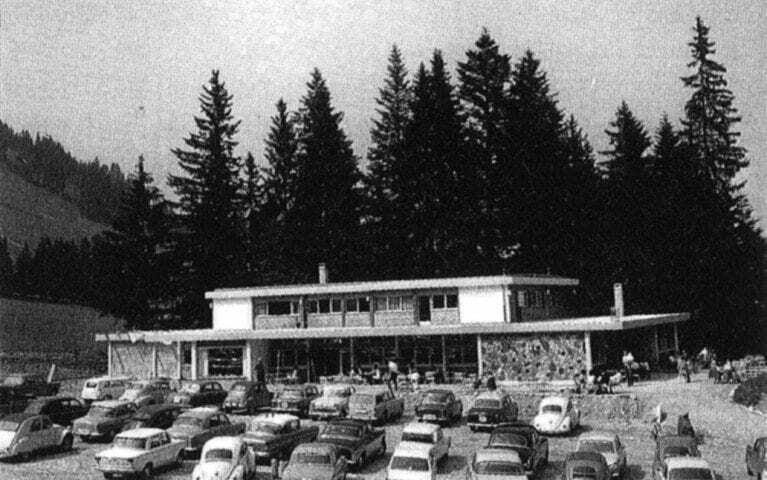 In 1976, the Migros supermarket chain seriously considered buying the entire tourist complex. Despite a valiant attempt at stabilizing the resort’s financial situation – the creditors agreed to renounce 90 % of their claims and convert the rest into shares – the supermarket giant abandoned Moléson to its fate. 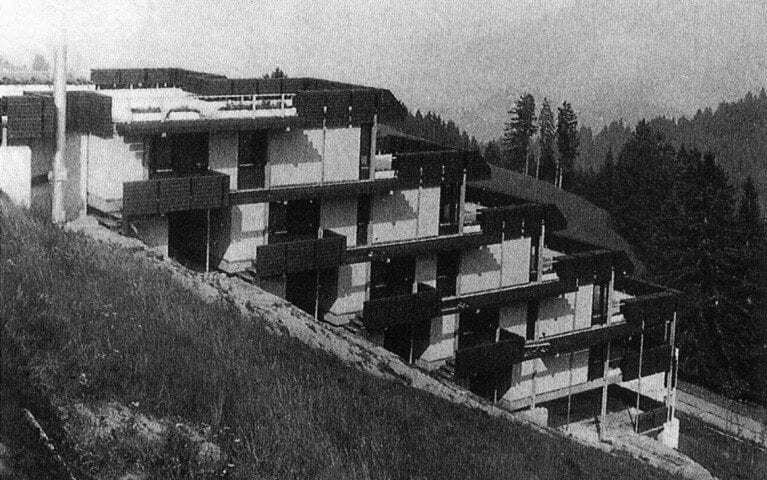 By 1988, the resort boasted 1,200 beds in chalets and apartments out of the 3,500 beds planned. Since that time, Moléson has survived the economic crisis, renovated its lift systems and enticed more summer visitors by developing an astronomical observatory at the top of the Moléson, a traditional cheese dairy in a 17th century alpine chalet and various summer sports activities. – Vers une renaissance de Moléson-Village, In Echo Illustré, July 15, 1978. – Vers une renaissance de la station du Moléson, In La Gruyère, June 8, 1978.